A not overly attractive young woman seeks the help of Sherlock Holmes. Her husband is missing. Only a few days later the missing husband arrives, breathless, at 221B Baker Street. His wife is missing. England’s greatest detective helps them. But then the mothers of both the young husband and the wife come asking for the services of Sherlock Holmes. Both of their children are missing and foul play is suspected. Together with Dr. Watson and with a little help from Mycroft Holmes, our wonderful sleuth must put an end to a string of murders, recover half a million pounds in stolen securities, and rescue the young couple from certain death at the hands of the evil powers. 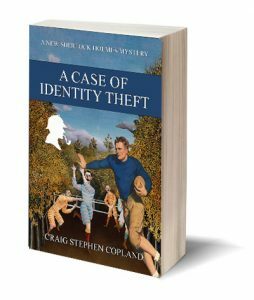 Fans of Sherlock Holmes will enjoy this new mystery with all the familiar characters and settings, but with a new and intricate plot and a storyline that reaches from the East End of London to Botany Bay and beyond.